(17/P79) TRENTON – Harvest the Bay Day, an eco-tourism event to raise public awareness of the sustainability of the Barnegat Bay Estuary, returns to Island Beach State Park on Saturday, August 12. The event – sponsored by the New Jersey Division of Parks and Forestry in association with two other non-profits – is scheduled from 11 a.m. to 3 p.m. at the Ocean Bathing Area 1 pavilion. The event is free with park admission. In case of inclement weather, the rain date is Saturday, August 19. Harvest the Bay Day aims to foster the public’s appreciation of Barnegat Bay’s natural environment, its role as a prime estuarine habitat and the various recreational as well as commercial fishing industries that depend upon the health and sustainability of this watershed. The bay has been the subject of increased environmental protection efforts in past years since Governor Christie’s launch of the comprehensive action plan in 2010. Visitors to Harvest the Bay Day can attend free clamming and seining programs from 11 a.m. to 11:45 a.m.; sample fresh seafood from noon to 12:30 p.m.; attend educational presentations from 1 p.m. to 1:30 p.m.; and take a free kayak eco-tour of the Sedge Islands. Island Beach State Park, one of the crown jewels of the state park system, offers a variety of interactive and educational nature programs, including Harvest the Bay Day, which was developed in 2013. Island Beach State Park interpretive programs are created and run through a partnership of the DEP’s Division of Parks and Forestry, the Conserve Wildlife Foundation of New Jersey, and the Friends of Island Beach State Park. Barnegat Bay is one of New Jersey’s most important bodies of water, covering some 660 square miles and providing opportunities for tourism, commercial and recreational fishing and habitats for a wide variety of coastal wildlife. 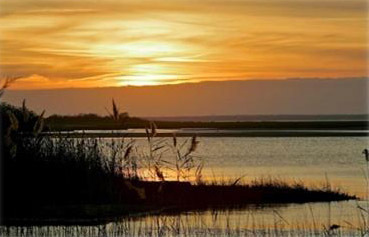 In 2010, under Governor Christie’s leadership, a comprehensive program was launched to enhance future protection of the bay through scientific research, water quality monitoring and analysis, implementation of stewardship projects, storm water management efforts, and purchase of important lands for open space protection. Events such as Harvest the Bay Day offer opportunities to learn more about the bay and our relationship to this New Jersey treasure. Media interested in covering Saturday’s event should contact the DEP Press Office at (609) 984-1795.